The compressor System object™ performs dynamic range compression independently across each input channel. Dynamic range compression attenuates the volume of loud sounds that cross a given threshold. It uses specified attack and release times to achieve a smooth applied gain curve. Properties of the compressor System object specify the type of dynamic range compression. Create the compressor object and set its properties. dRC = compressor creates a System object, dRC, that performs dynamic range compression independently across each input channel over time. dRC = compressor(thresholdValue) sets the Threshold property to thresholdValue. dRC = compressor(thresholdValue,ratioValue) sets the Ratio property to ratioValue. dRC = compressor(___,Name,Value) sets each property Name to the specified Value. Unspecified properties have default values. Example: dRC = compressor('AttackTime',0.01,'SampleRate',16000) creates a System object, dRC, with a 10 ms attack time operating at a 16 kHz sample rate. Compression ratio, specified as a real scalar greater than or equal to 1. Compression ratio is the input/output ratio for signals that overshoot the operation threshold. Assuming a hard knee characteristic and a steady-state input such that x[n] dB > Threshold, the compression ratio is defined as R=(x[n]−T)(y[n]−T). R is the compression ratio. x[n] is the input signal in dB. y[n] is the output signal in dB. Knee width is the transition area in the compression characteristic. Attack time is the time it takes the compressor gain to rise from 10% to 90% of its final value when the input goes above the threshold. Release time is the time it takes the compressor gain to drop from 90% to 10% of its final value when the input goes below the threshold. 'Auto' –– Make-up gain is applied at the output of the dynamic range compressor such that a steady-state 0 dB input has a 0 dB output. Make-up gain compensates for gain lost during compression. It is applied at the output of the dynamic range compressor. audioOut = dRC(audioIn) performs dynamic range compression on the input signal, audioIn, and returns the compressed signal, audioOut. The type of dynamic range compression is specified by the algorithm and properties of the compressor System object, dRC. [audioOut,gain] = dRC(audioIn) also returns the applied gain, in dB, at each input sample. Audio input to the compressor, specified as a matrix. The columns of the matrix are treated as independent audio channels. Audio output from the compressor, returned as a matrix the same size as audioIn. Gain applied by compressor, returned as a matrix the same size as audioIn. Use dynamic range compression to attenuate the volume of loud sounds. Set up the compressor to have a threshold of -15 dB, a ratio of 7, and a knee width of 5 dB. Use the sample rate of your audio file reader. Visualize the compression static characteristic. 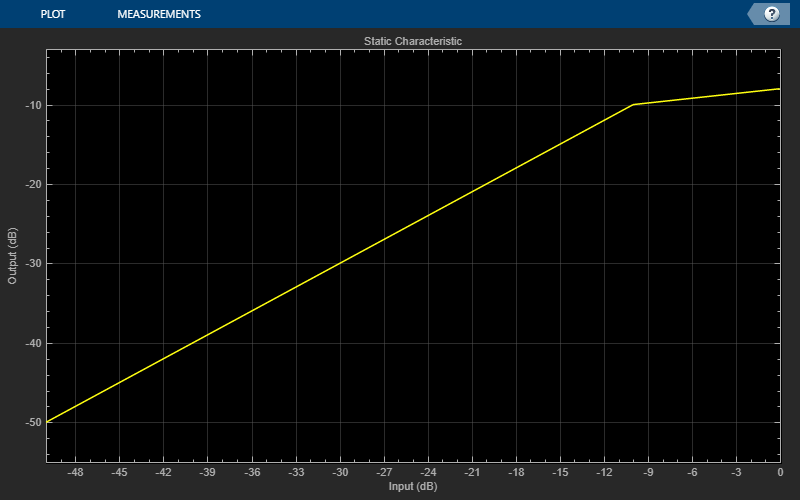 Set up the scope to visualize the original audio signal, the compressed audio signal, and the applied compressor gain. Create an dsp.AudioFileReader to read in audio frame-by-frame. Create a audioDeviceWriter to write audio to your sound card. Create a compressor to process the audio data. Call visualize to plot the static characteristic of the compressor. Create a dsp.TimeScope to visualize the original and processed audio. Call parameterTuner to open a UI to tune parameters of the compressor while streaming. Visualize the original audio, the processed audio, and the gain applied. 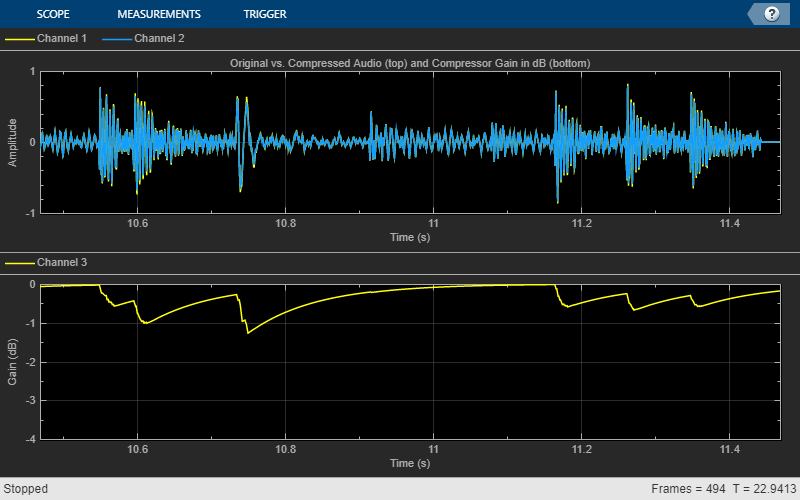 While streaming, tune parameters of the dynamic range compressor and listen to the effect. The compressor System object processes a signal frame by frame and element by element. xdB[n] passes through the gain computer. The gain computer uses the static characteristic properties of the dynamic range compressor to attenuate gain that is above the threshold. where T is the threshold, R is the ratio, and W is the knee width. Given a steady-state input of 0 dB, this configuration achieves a steady-state output of 0 dB. The make-up gain is determined by the Threshold, Ratio, and KneeWidth properties. It does not depend on the input signal.